Clara Miller is president of the F.B. Heron Foundation, which helps people and communities help themselves out of poverty. Prior to assuming the foundation’s presidency, Miller was president and CEO of Nonprofit Finance Fund, which she founded and ran from 1984 through 2010. In addition to serving on Heron’s board, Miller is on the boards of the Sustainability Accounting Standards Board (SASB), Family Independence Initiative, The R.S. Clark Foundation and StoneCastle Financial Corp. She is a member of the U.S. Advisory Committee to the G8 on Impact investing, named in 2014. She is a member of the Social Investment Committee of the Kresge Foundation. From 2010–2014, Miller was a member of the first Nonprofit Advisory Committee of the Financial Accounting Standards Board. Clara Miller discusses the role of a healthy capital investment in helping an organization to optimize its impact. We all understand how money works in the nonprofit sector—true or false? Find out for yourself in this NPQ classic, as Clara Miller takes us inside the strange and often contradictory world of nonprofit money. In this second of a two-part series, Clara Miller, president of the F.B. Heron Foundation, discusses the ways in which a change in the operating model of philanthropic foundations can expand their purviews, effectiveness and impact. The Heron Foundation has long been an influential philanthropic player on the national scene. Its board’s historic advocacy on the use of philanthropic assets as mission related investments (MRIs) has been central to discussions of how to approach the full deployment of assets in pursuit of goals. Now, in this two-part series, Clara Miller, the foundation’s president, lays out in detail the ways that ideology and practice fit together in this foundation’s still evolving and historically ambitious engagement with the larger economy. In our opinion, this is a must-read for those serious about philanthropic impact. When times get tough, the President and CEO of Nonprofit Finance Fund, Clara Miller, is a wellspring of good advice. We hosted a webinar conversation between Clara and Editor in Chief, Ruth McCambridge. We've archived the video, so you can download the whole thing here. 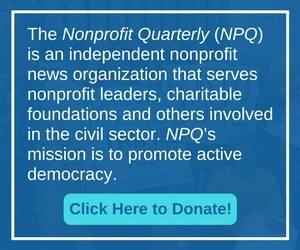 NPQ has done any number of stories recently on nonprofits, their buildings, their debt, and finally the restructuring they are doing in the wake of the recession, so we wanted to rerun this excellent piece on those issues by Clara Miller in the hope that it may help with your own considerations in these areas. If two sources of funding are good, are three sources better? As sources of capital, funders can unintentionally contribute to the systematic under-capitalization of the sector–encouraging the growth of programs without providing for a commensurate growth in capacity. Clara Miller offers advice for reversing this trend. Understanding where we want our organizations to go depends greatly on understanding where we are and how our organizations behave under different conditions. The case studies in this edition are an opportunity to look at patterns of organizational behavior and apply them to our own situations.